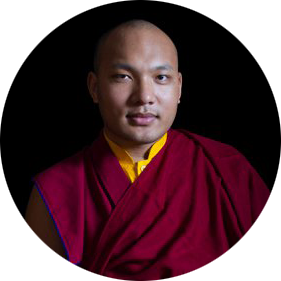 His Holiness the 17th Gyalwang Karmapa’s vision is to relieve the suffering of all sentient beings. He urges everyone to extend their compassion to include animals, and insists that compassion needs to be translated into action. For many years, the International Kagyu Monlam has organised medical camps and food kitchens to help local people, but, during the 31st Kagyu Monlam, at the instigation of His Holiness, they organised a veterinary camp in order to address the needs of animals in the area. That first camp was very successful, and so the Gyalwang Karmapa directed that a further veterinary camp be organised in conjunction with the 32nd Kagyu Monlam. The animal camp is being held from 2-8 December, 2014 at the Kagyu Monlam Pavilion, Bodhgaya. This morning, the Karmapa visited the camp, accompanied by Sri Sunjay Kumar Agarwal, A.I.S., the District Magistrate and Collector of Gaya District. During an informal discussion, the D.M. asked His Holiness to include the town of Gaya in this year’s programme, and His Holiness agreed. Together they walked through the camp, asking questions of the staff and watching various procedures underway. In the first room they witnessed two dogs being prepared for surgery and saw a demonstration of ultrasound equipment. In the operating theatre, three vets were already operating on three dogs, and, outside, in separate compounds, woozy animals lay recovering from the morning’s surgery, while others awaited their turn. In addition, at the outpatients’ clinic, situated in front of the Monlam Pavilion, they saw a lame pony, a distressed puppy and a camel, all patiently awaiting medical care. The core expertise for the camp comes from volunteers from the Sikkim Anti-Rabies Animal Husbandry Division [SARAH], Tibet Charity, Dharamsala, India, England and Australia, all of whom are working hard on various animal programmes. One team will conduct a surgical sterilisation, anti-rabies vaccination and general treatment for dogs. Another team will staff a clinic for local animals. Following a request from the Gyalwang Karmapa that they pay more attention to the needs of the local villages, a third team will concentrate on an outreach programme to the villages. Working in close co-ordination with the local panchayats [village councils] the team hopes to visit all thirty or more villages in the Bodhgaya area during the week, offering medical assistance and advice on the care and management of livestock and pets. A fourth team will conduct an education campaign in schools and monasteries on animal welfare, dog bite prevention and anti-rabies. Financially, this year’s camp is being supported by the Government of Sikkim who deputed members of staff from the Sikkimese Anti-Rabies and Animal Health Division to attend, the Brigitte Bardot Foundation which has contributed €8000 towards medicines, equipment, vehicles, dog food, promotional materials, travel costs of the SARAH team and ancillary costs, and the International Kagyu Monlam Trust. Staff at the camp have been encouraged to see how the influence of this important work is spreading. Gaya District has a major problem with street dogs and rabies. The District Magistrate was so impressed by the effectiveness of last year’s animal camp initiative that he approached the CEO of Kagyu Monlam, Lama Choedrak, and Dr Schuetze, and asked them to organise a training programme for local vets. Consequently, ten local vets will be joining the animal camp as observers and trainees this year. Afterwards, a group of them will be sent to train further with SARAH in Sikkim, which is an accredited national training centre under the Animal Welfare Board of India. Sri Sunjay Kumar Agarwal hopes that Gaya District will then be able to operate its own ABCAR [Animal Birth Control–Anti-Rabies] programme.